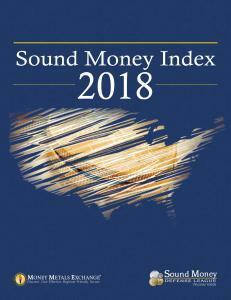 CHARLOTTE, NORTH CAROLINA, USA, July 9, 2018 /EINPresswire.com/ -- Utah, Texas, and Wyoming round out the top three most sound money-friendly states in the United States, according to the 2018 Sound Money Index, released today by the Sound Money Defense League and Money Metals Exchange. Federal policy and the privately owned Federal Reserve System are the root causes of inflation, instability, and currency devaluation, said Jp Cortez, Policy Director at the Sound Money Defense League. However, he noted, states can take some steps to protect their citizens from the ill effects of America’s unbacked paper money system.